Let’s just say this stew will give your colon a good cleaning. I made a huge pot of this. We had it for dinner the first night (Thomas, who can’t handle much heat when it comes to spice, managed to enjoy it…I think). Then, I ate the leftovers for lunch over the next couple of days. It’s definitely one of those stews that improves as it melds in the fridge. Yeah, it was a good three or four days of tootin’. But what can I say? It’s good for you! All those heart-healthy, leafy greens and immune-system-boosting white root veggies, with lean chicken, antioxidant-rich tomatoes, and lots of fiber…this is like a health food store in a pot! And, as most of my volumized dishes go, you can eat a ton of it! At 6 servings for the whole batch, each serving is pretty darn big. I will note that while most of the nutrition stats are excellent, this is pretty high in sodium, even after using low sodium chicken broth and without adding any additional salt to the stew. That’s probably because of the cannellini beans and the canned tomatoes. So if the scale is a bit higher for a day or two after eating this stew, it’s probably just water retention. So I plan to make this one-pot-wonder for the Ward clan next week, and I’m not going to warn those Wards living at home (about the spice or the subsequent flatulence) because I gave fair warning in this blog. This might be mildly entertaining. Whisk together mustard, corn starch, and ¼ cup of the wine. Set aside. Spray a dutch oven with nonstick cooking spray, then add the oil and heat. Add the onions, garlic, and rosemary, and cook for 1 minute, stirring constantly. Add the remaining 1 cup of wine, cover, and bring to a boil. Uncover and cook until wine has almost evaporated, about 5 to 6 minutes, stirring occasionally. Add the chicken, chicken broth, and 4 cups of the kale. Bring to a boil, then simmer, stirring occasionally, for 4 minutes. 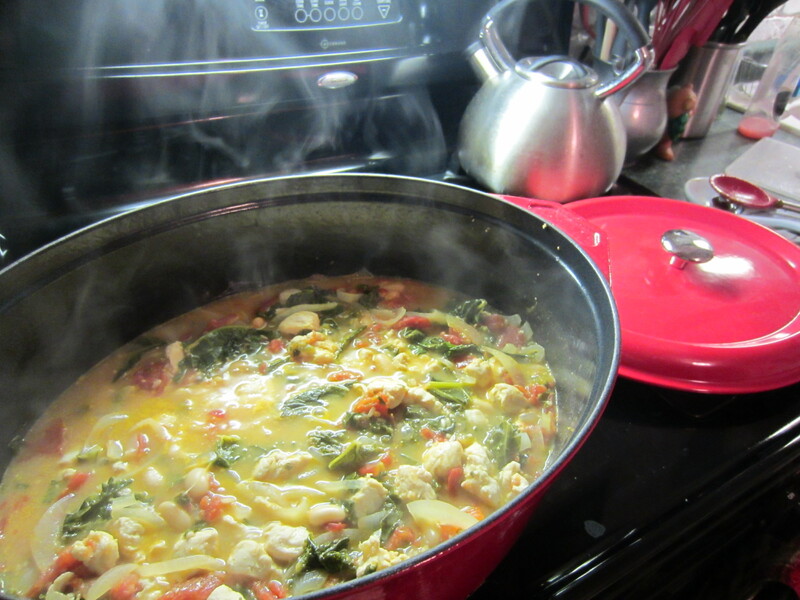 Then add the remaining 2 cups of kale and simmer for 2 minutes. Stir in the pepper, white beans, and tomatoes, then whisk in the cornstarch mixture. Bring the stew to a boil, then simmer for an additional 5 minutes. Let cool for a couple of minutes, and serve. Jenny Craig: Works great for lunch or dinner, but beware water retention from the sodium. BTW, anyone catch the name reference?